Deep South Containers is one of the leading demolition companies Lafayette, LA and Lake Charles, LA has to offer. We are a Louisiana owned and operated demolition company that serves all of Louisiana as well as east Texas and parts of Mississippi. 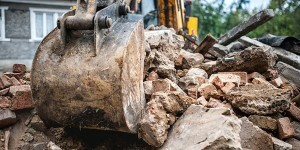 As one of the leading demolition companies in Louisiana, we walk you through the demolition process, making it as simple and hassle free for you as possible. We have the expertise, qualifications, and professionalism to handle all your demolition requirements. Commercial Demolition– We are skilled at the removal of larger structures such as shopping strips or office buildings. Residential and House Demolition– We can take care of everything from house demolition to removing smaller structures like sheds, garages, decks, and interior projects such as kitchens and bathrooms. Concrete Demolition– We have experience with concrete slabs, driveways, pool decks, patios, and more. We are licensed and insured and prepared to handle your demolition project, whether large or small. We are proud of the fact that we have proven that we have the right experience and are confident that we will get the job done. At Deep South Containers we provide a wide variety of services beyond demolition. We also provide dumpster rentals, front load dumpsters and waste removal services.